We live in an age when conventions are being brushed off the table: we can wear everything with everything, coffee and edible flowers coexist courteously, square-shaped pizza is normal, and it’s no big deal when a bicycle store offers specialty coffees, as well. 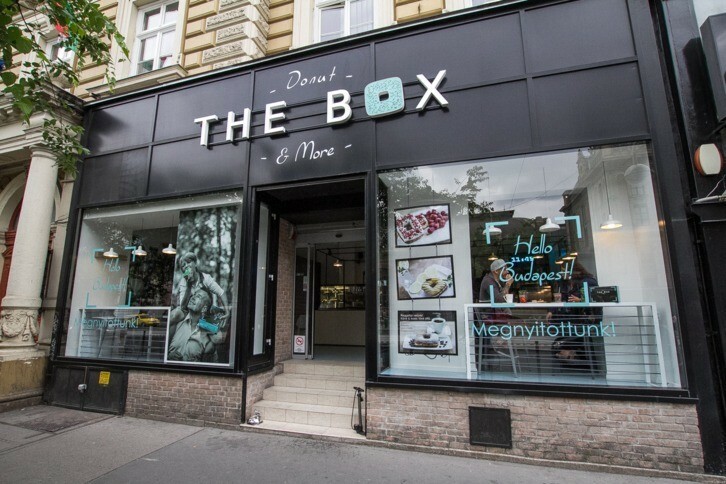 Now open near downtown Budapest’s Nyugati Square, The Box Donut continues this trend by selling doughnuts with cubic dimensions instead of the ordinary circular structure. 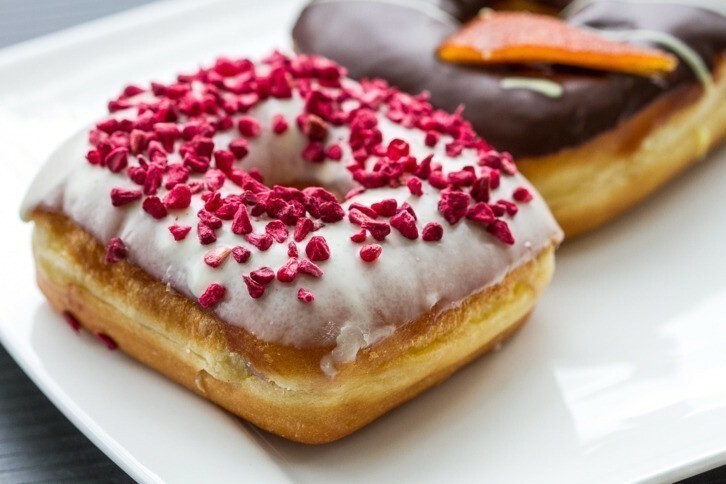 We are happy to discover that in the process of changing the basic doughnut design, the confectioners did not detract from their products’ quality and flavors. Most of us have had square pizza at some point – at first glance, we mistrusted this unusual creation, but then discovered after the first bites that cubic slices are just as good as their circular siblings (if not better). 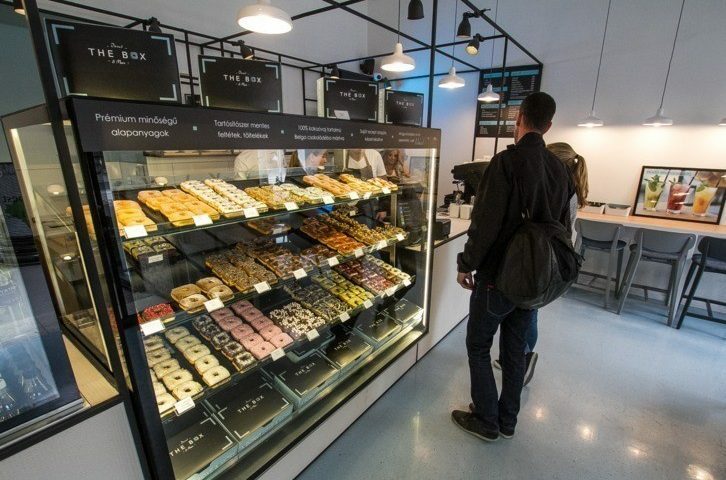 The situation is somewhat similar to thedoughnut scene in Budapest, as well: The Box Donut is now open near Nyugati Square, and as its name suggests, the shop sells cube-shaped doughnuts. 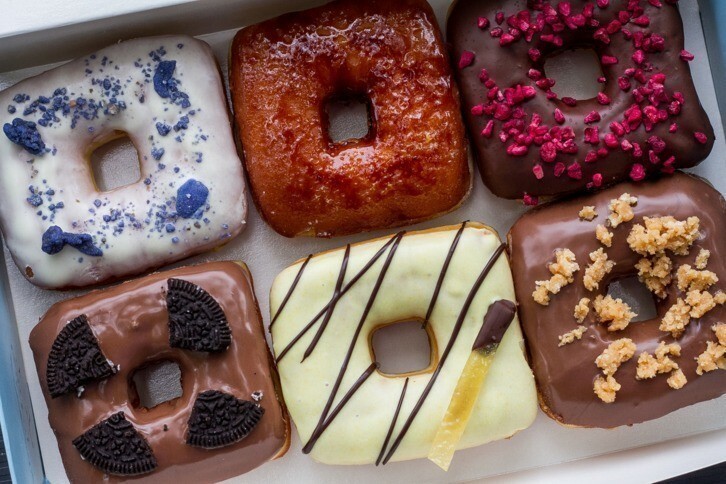 Although it is undeniable that this confectionary creation is the result of a conscious brand-building effort – from a gastronomic point of view, the shape of a doughnut is insignificant – we are still impressed with the final product, mostly because of everything else about these scrumptious square treats. The management of The Box Donut did not tell us how exactly the doughnuts are made, but it is public information that they are coated with Callebaut chocolate containing 100% cocoa butter, that every doughnut is made without preservatives (which is why they should be eaten within a few hours of being made), and that they use peanut oil for frying. The doughnuts can be purchased separately for 390 forints each, but we can also order them in boxes of six or eight. If we choose to take them home, we can also choose one of the many stickers that cheer up the boxes with messages like “szeretlek” (“I love you”). 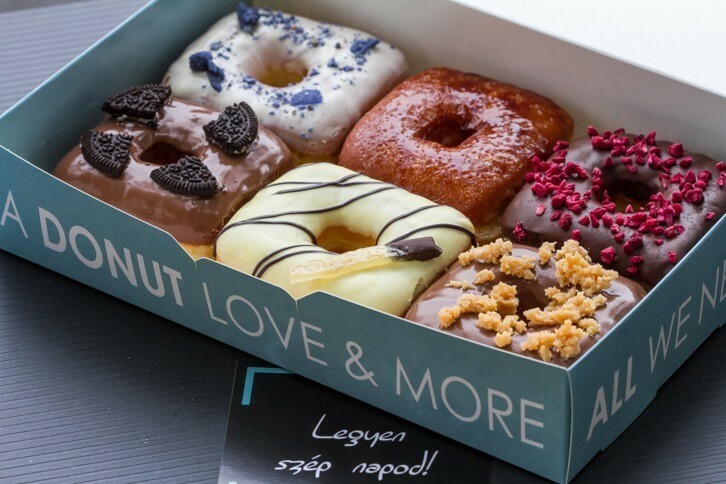 However, the “legyen szép napod” (“have a nice day”) sticker comes with every purchase, and even though it is a bit clichéd, it feels good to receive a bit of positive energy with our doughnuts. Currently, there are more than 25 kinds of doughnuts available, and even though we were not able to taste all of them, we tried a raspberry one and another with caramel cream. 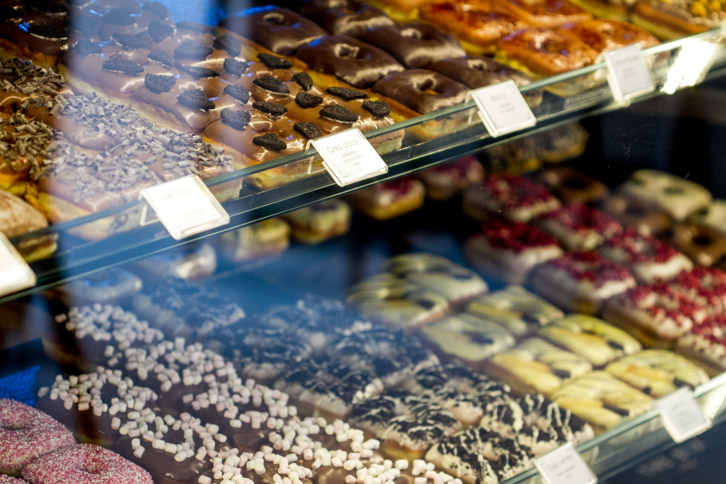 We do not want to overanalyze such a simple pleasure as having a doughnut, but it is worth noting that The Box Donut provides treats that are crispy instead of oily, filled with generous portions of cream, and that the fruits’ flavors are not too intense or obtrusive, as we’ve experienced with doughnuts made with artificial flavorings. There is no doubt that this raspberry is real. 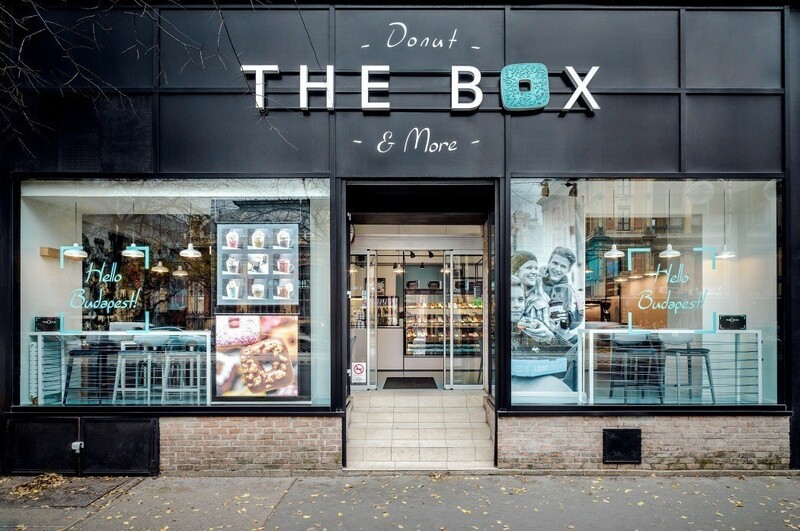 The Box Donut also sells sandwiches (which are also rectangular, less surprisingly), coffee, syrup-based sodas, and their own mint-and-lemon-infused water. We would also like to highlight the amazing service and the friendly staff – something that is still absent at many places in Budapest. Address: 1066 Budapest, Teréz Boulevard 62.